Going to the dentist is always a treat for me. My dentist and I joke about how it's like going to a spa, because I get an hour of KID-FREE TIME to lie down, close my eyes and have a professional work her magic on me to make me healthier and prettier. As an added bonus, I go home with toothpaste and floss samples, a fresh and squeaky-clean feeling in my mouth, and a renewed determination to keep my mouth healthy. If I had my way, I'd visit the dentist every month! Of course, it's a different case when you actually have to go. A couple of weeks ago I wrote about how I used to go to the dentist four times a year because my gums were, shall we say, in less than perfect health. No matter how much I enjoy my spa dental visits, my goal was to decrease the frequency and get to a point where my gums didn't need to be checked so often! Thanks to a vigilant oral care routine, I've finally gotten to that point -- and thanks to a new oral care line, I might even get to enjoy that squeaky-clean after-dentist-visit feeling even though I haven't been to the dentist in a while! I'm talking about the Crest and Oral-B Pro-Health Clinical Line -- consisting of Crest® Pro-Health® Clinical Plaque Control Toothpaste, Crest® Pro-Health® Clinical Rinse, Oral-B® Pro-Health ® Clinical Pro-Flex Toothbrush and Oral-B® Glide ™ Pro-Health ® Clinical Protection Floss. Mom Central Consulting sent me these products to review, and I've been using them daily for several weeks now as part of their Crest and Oral-B Pro-Health Clinical Plaque Control Test Drive campaign. I think these products are great, and I'd definitely buy them again! 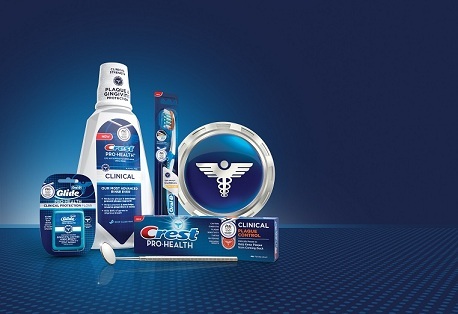 Introducing the Pro-Health Clinical Line from Crest & Oral-B. When used together, these products not only significantly reduce plaque, they also help keep it from coming back. Crest Pro-Health Clinical Plaque Control toothpaste not only gets rid of plaque, it’s also clinically proven to help keep plaque from coming back, so you can have a clean, healthy mouth at home. Crest’s plaque control toothpaste formula protects against plaque, gingivitis, cavities and tooth sensitivity, while also whitening teeth and freshening breath. I love this toothpaste! It tastes great, and it has some kind of "crystals" in the toothpaste that give it a crunchy, gritty feeling for the first minute or so of brushing. It feels just like the toothpaste that they use on my mouth in the dentist's office! This toothpaste really leaves my mouth with a clean, minty feeling. My one concern with this toothpaste was that the label says the stannous flouride used may produce surface staining of the teeth. But after doing some research, I was reassured to know that staining which can be avoided by proper brushing, and it isn't permanent. Moreover, Crest's particular formula is stain-resistant. Also, I read that stannous fluoride has been shown to be more effective than sodium flouride (which seems to be the more common, and less expensive, flouride ingredient in toothpastes) in reducing the incidence of cavities and gingivitis. So it's all good -- and now that my concerns are allayed, I will definitely be buying this toothpaste in the future. Our most advanced rinse ever, Crest Pro-Health Clinical Rinse, helps you maintain your dental cleaning with clinical strength plaque and gingivitis protection. It is clinically proven to reduce plaque and help prevent plaque regrowth, and clinically proven to help prevent and reverse gingivitis in as little as 2 weeks. It also kills 99% of germs to improve breath. When I first used it, I thought the rinse had a funny taste, but once you rinse and spit, the aftertaste is wonderful! It leaves your mouth feeling minty and tingly-fresh. That feeling is far more intense and long-lasting than any other mouthwash I've tried! Even better, you don't feel as though your mouth is burning while you're swishing the stuff around your mouth. I must admit a moment of concern when I read the label and saw "hydrogen peroxide" on the list of ingredients. What? I'm putting bleach in my mouth? But a quick trip to the ADA website reassured me that hydrogen peroxide is indeed commonly used as a bleaching agent in over-the-counter oral care products, and the FDA has approved 3% solutions of hydrogen peroxide for use as a mouthwash. I'm on the fence about using it daily on a long-term basis, though, since I've also read that overuse may actually damage cells and soften tooth surfaces. This is the first and only toothbrush with individual Pro-Flex sides that adjust to the unique contours of your teeth and gums. As a result, it removes more plaque than a regular manual toothbrush. Because of its flexibility, Clinical Pro-Flex delivers an outstanding, gentle clean. On my dentist's recommendation, I use a sonic toothbrush, but I would definitely use the Oral-B Pro-Health Clinical Pro-Flex Toothbrush occasionally, like when I go on trips and need a travel toothbrush. I like the soft, flexible bristles and flexible head. Oral-B Glide Pro-Health Clinical Protection Floss is our most advanced plaque control floss ever. It helps reverse gingivitis in 2 weeks as part of a comprehensive dental health routine. My dentist recommends woven dental floss, and I really love the way it doesn't cut into my gums the way string or flat waxed floss can do -- but it can be very difficult to find. After trying Oral-B Glide Pro-Health Clinical Protection Floss, I've decided it's going to be my second-in-line floss. It's not as soft as woven floss, but it's still quite gentle on the gums, and it does glide in between my teeth very nicely. And like the Crest Pro-Health Clinical Rinse, this floss doesn't just have a nice minty taste, it actually leaves a minty tingle in your mouth after you're done! All in all, I think these products work nicely together, and they definitely leave my mouth with a clean, healthy feeling. How much of that "feeling" actually translates into less plaque, only my dentist knows. I'm not scheduled to visit her for another 4 months, but with the Pro-Health Clinical line, I can go through those 4 months feeling a lot better and more confident about my teeth and gums. Win a trip to the 2012 Olympics! The sweepstakes begins on March 15th and will run through May 31st. No purchase necessary. Void where prohibited. 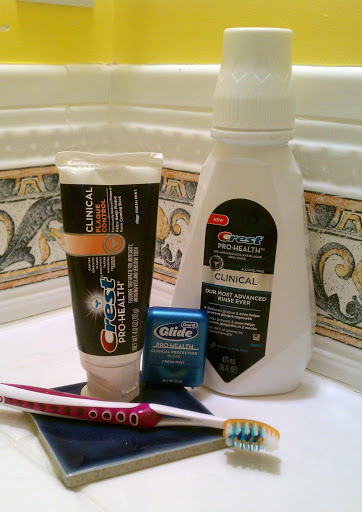 Disclosure: I wrote this post while participating in a test drive campaign by Mom Central Consulting on behalf of Crest and Oral-B and received product samples to facilitate my candid review. Mom Central Consulting sent me a promotional gift to thank me for taking the time to participate. The views and opinions expressed here are my own.